A well-bred Alaskan malamute is a joy to own. Independent and loving, this beautiful creature wants nothing more than to be a part of his family. They are, by nature, working animals, but they are frequently trained for the show ring, obedience, agility, sledding, and weight pull. They can make wonderful therapy dogs, too. Your puppy’s purchase price is just the beginning of what you spend over its lifetime. Think ahead to 10-12 years of veterinary bills and the importance of choosing a puppy whose ancestors have been screened for common health issues, which have a genetic basis. 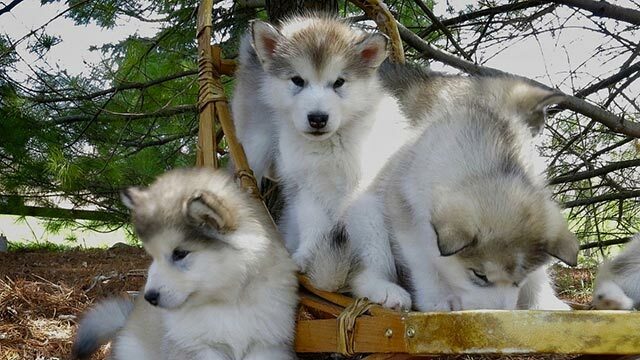 There is a wide variety of colors and “looks” for Alaskan Malamutes. They can be gray, black, or red with a large range of markings on their faces. They can also be pure white. The average lifespan of the Alaskan malamute is approximately ten years. While veterinary science has made many exciting advances, malamutes, like other dogs, can have health problems. These breeders take their dogs very seriously and try their best to breed happy and healthy malamutes. Contact the Corresponding Secretary or Web Site Committee.